Founded in 1797, Waynesville is one of Ohio's older communities and makes the most of its historic past. 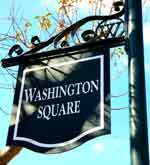 Antique stores, furnishings, refurbished inns and buildings can be found in the historic downtown area. The town has also trademarked the name: "Antiques Capital of the Midwest." When Samuel Heighway first plotted out the town on the east bank of the Little Miami River in 1797. He modeled the layout after a New England village. Located on the west bank of the Little Miami River, Samuel Heighway plotted out the town to resemble a New England Village. It was at this time that General Anthony Wayne had successfully defeated a large contingent of Native Americans at the Battle of Fallen Timbers that led to the signing of the Treaty of Greenville. In honor of his military success, they named the new villages after General Wayne. The original land was purchased by Heighway from Judge John Cleves Symmes, who was the father-in-law to William Henry Harrison, America's 9th President. 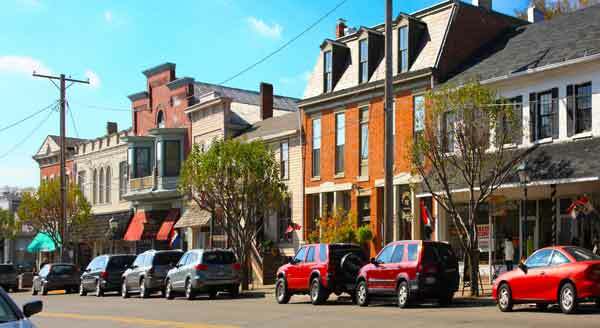 Today, Waynesville retains much of the charm as well as the original names given by Heighway. The town is laid out in a grid with the town square at the center. Waynesville was also a major Quaker settlement as noted in the 1905 Friends Board Home which houses the Museum at the Friends Home, and serves as a cultural center for Waynesville. The museum includes 16 rooms featuring historic exhibits that highlight varying aspects of early Quaker life, period clothing, local medicine and education. The Quaker Historical District is listed on the National Register of Historic Places. Located next to Caesar's Creek State Park and Pioneer Village, Waynesville has also been referred to as one of the most haunted towns in Ohio. Each fall as Halloween approaches, the Museum at the Friends Home puts on their annual Ghostly History Walking Tours of old Waynesville. 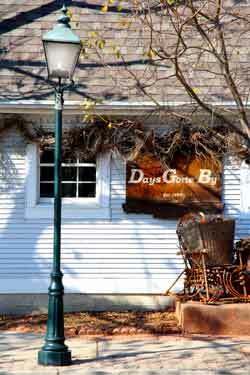 Waynesville also has close to 100 shops and eateries that include antiques, vintage, shabby-chic, retro and just plain fun. For history buffs, Waynesville was also an important stop on the Underground Railroad. But perhaps Waynesville is also known for it's famous Sauerkraut Festival. One festival among the 1000s of festivals in Ohio each year that is distinctive is the Ohio Sauerkraut Festival held in Waynesville each year on the second full weekend in October. In 1970, as the Waynesville Retail Merchants were planning to hold a sidewalk sale, it was suggested that a sauerkraut dinner be served as part of the event. With this decision, the Ohio Sauerkraut Festival was born. That fall, on October 3, Waynesville hosted its first Sauerkraut Festival, serving 528 pounds of sauerkraut to approximately 1500 visitors. Entertainment included an antique car parade, German bands and folk dancers, checkers and spelling bee contests, and of course, prizes for the largest head of cabbage and the best homemade sauerkraut. Booths were set up on Main Street to sell kraut-containing foods (including sauerkraut ice cream), fall harvest produce, and display the antiques, arts, and crafts of a few vendors. Word of the high-quality food, entertainment, and crafts spread quickly and the Festival attracted crowds of approximately 4000 in 1971 that grew to 10,000 in 1972. The Festival continued to attract ever-larger numbers of visitors, surpassing 40,000 in 1976. Today the Ohio Sauerkraut Festival serves out 7 tons of sauerkraut and attracts approximately 250,000 visitors each year to browse among the almost 500+ craft booths and sample the offerings from more than 30 different food booths. It continues to be one of the top quality festivals in the United States, attracting visitors and vendors from every state across the Nation. Vendors come from as far as Hawaii, Florida and California to participate in the festival.